Note: While this review will be spoiler free, it will reference previous books. If you haven’t started this series yet, check out VBC’s review of book 1, A Darker Shade of Magic. A darkness has been growing from the depths of Black London. Finally, it has found a way out, setting its sights on Red London, coveting all the power it holds. 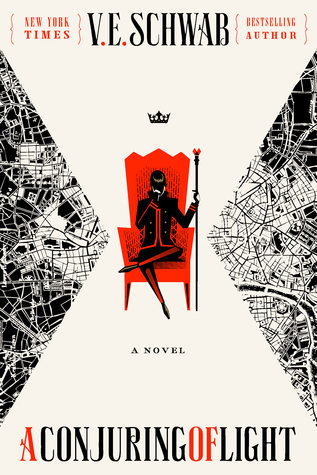 As it works its seemingly unstoppable way through the bodies and minds of Red London’s citizens, it will call itself Osaron and crown itself a king. But not all will succumb to the darkness. Some will fall, many will fight. In the midst of this fight, the three Antari will set themselves apart. It will take all their power, plus a little more, to push the darkness away. This final battle will take cunning, and it will take sacrifice. No one will get out unscathed. So A Gathering of Shadows left off in a huge cliffhanger when Kell was tricked into going to White London only to be taken prisoner by Holland, who had allowed Osaron to use his body as a vessel. Meanwhile, due to the link between Kell’s life and his brother Rhy’s, Rhy’s life too hangs in the balance as Kell is struggling to stay alive trapped in White London. So enters Delilah Bard, thief, magic user, and sometimes pirate to save the day. Or at least save the hour. Because as they all discover, this is only the beginning. I was very happy that A Conjuring of Light picked up immediately where AGOS ended. There is so much ground to cover in this book, and no time was wasted at all. If anything, I was impressed at how much V.E. Schwab continued to build on this world even when we’re at the beginning of the end, as it were. There was so much more to learn about certain characters that I didn’t even know I wanted until I got to the end and then I realized the book would not have been the same without the extra backstories. Because not only are these secondary characters enriched, but their inclusion aids in the growth of our main protagonists: Kell, Lila, and Rhy. One particular I need to call out is the third Antari, Holland. He’s been a constant antagonist throughout the first two books in this trilogy, and he certainly doesn’t make matters better when he welcomes Osaron to use his body and gain access to the world. While his past makes him a more sympathetic character, it was how he dealt with his mistakes that made me like him. He’s the oldest of the three Antari and comparatively the most powerful (at least the most knowledgeable) in the ways of magic. The way his trials and tribulations are able to bring the three together, and the way he decidedly goes about making reparations he becomes someone you can possibly, even begrudgingly, respect. It is the mark of a great writer/story. Also, as much as ADSOM was Kell’s book and AGOS was Lila’s book, ACOL is definitely Rhy’s book. Going from the rakish prince, heir to the throne, doesn’t take anything seriously, to stepping up and fighting for his kingdom, not cowering behind the castle doors, and having to make some difficult decisions along the way, he really grew the most in this book. I would love to go on and on about this book and this series, but the best thing I think I can say is that it’s one of the most satisfying trilogies all the way through—beginning to end—that I’ve read. The world and characters and magic are just perfectly written and I’m really hoping we’ll get more in the world (if not with these particular characters) because it would be sad to put it all to rest. There are so many more adventures to be had. So I will leave you as the Red Londoners would: Anoshe. Until another day.